Fourthly: Striving to be patient and persevering against those who oppose this da’wah (call) to Allâh and those who seek to cause harm – patiently bearing all these hardships for the sake of Allâh. Firstly: confusing good with evil, so it neither recognises the good, nor rejects the evil. This disease may take hold of it to such an extent that it believes good to be evil; and evil to be good, Sunnah to be bid’ah (innovation); and innovations to be the Sunnah, and the truth to be falsehood; and falsehood the truth. Secondly: judging by its whims and desires, over and against what Allâh’s Messenger sallallâhu ’alayhi wa sallam came with – being enslaved by its whims and desires and being led by them also. “(The Âyah): “You alone do we worship.” [Sûrah al-Fâtihah 1:5] is built upon four principles:- Ascertaining what Allâh and His Messenger love and are pleased with, from [i] the sayings of the heart and [ii] of the tongue; and [iii] the actions of the heart and [iv] of the limbs. The saying of the heart: It is i’tiqâd (belief) in what Allâh – the Most Perfect – informed about His Self; concerning His Names, His Attributes, His Actions, His Angels, and all that He sent upon the tongue of His Messenger sallallâhu ’alayhi wa sallam. The action of the heart: Such as love for Him, reliance upon Him, repenting to Him, having fear and hope in Him, making the Dîn purely and sincerely for Him, having patience in what He orders and prohibits, having patience with what He decrees and being pleased with it, having allegiance and enmity for His sake, humbling oneself in front of Him and having humility in front of Him, becoming tranquil with Him and other than this from the actions of the heart which are actually connected to the action of the limbs … and actions of the limbs without the action of the heart is of little benefit, if any benefit at all. 2. The following are some points of benefit – extracted from the various works of the Shaykh – pertaining to purification of the souls and curing the diseases of the hearts. 6. Zâdul-Ma’âd fi Hadî Khayril-’Ibâd (pp.9-11). 7. Related by Muslim (no.144), from Hudhayfah radiallâhu ’anhu. And it is from the likes of such weeping souls that we have inherited the knowledge of our Religion! 1. Related by Muslim (no.2721). Beneficial points conveyed by brother Nabil Chogle [student of knowledge – recommended by Shaykh al-‘Anjaree (hafidhahullah)]. Some of the Kuwaiti Mashaykh the brother , Nabil Chogle, studied under are Shaykh al-‘Anjaree, Shaykh Tariq as-Suba’ee and Shaykh Ahmad as-Suba’ee (hafidhahumullah). Both Shaykh ‘Anjaree and Shaykh Ahmad as-Suba’ee have a recommendation from Shaykh Rabe’e and Shaykh ‘Ubayd al-Jabiree (hafidhahumullah). Shaykh ‘Anjaree (hafidhahullah) said Shaykh Rabe’e (hafidhahullah) praised Shaykh Taariq as-Suba’ee (hafidhahullah) saying he is “Hakeem Hakeem” (Wise Wise – Twice) i.e. he is really good. 1. Shaykh al-‘Anjaree (hafidhahullah) constantly advised to be on the Furqaan (That which distinguishes truth from falsehood). 2. 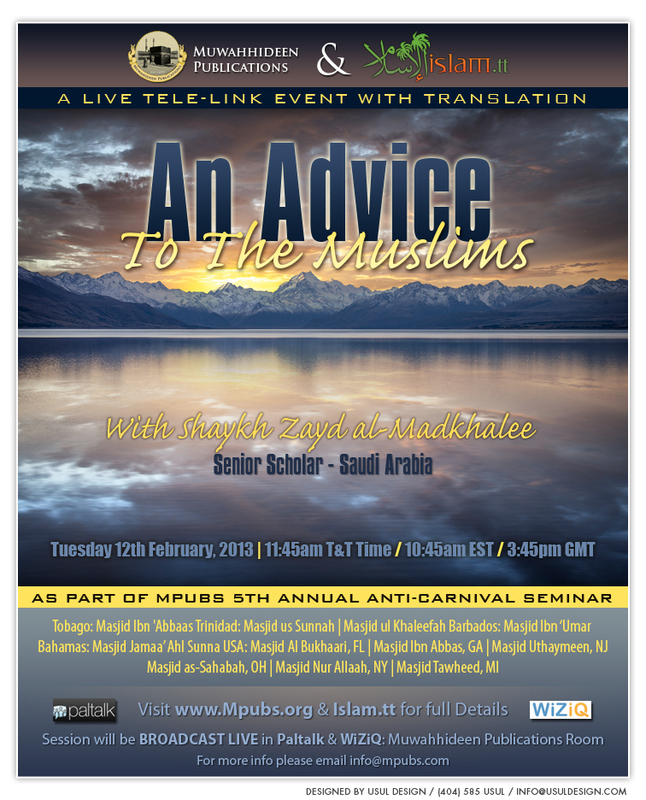 The Shaykh also warned about the dangers of falling into Bid’ah (Innovation in the religion). is that we don’t just seek refuge from the evils which our hands have brought forth rather we also seek refuge for the sins into which we fell and which were then followed by others. In Islaam you are rewarded for the good deeds you do and also for those people who follow you in good. Similarly you are punished for the sins that you do and for the misguidance of others who follow you in such sins. 4. The evils of some innovations can be seen hundreds of years later. One of them is the counting of the beads which was not legislated during the time of the Prophet (sallallahu ‘alayhi wasalam). Another example is the seeking of refuge in Allah while yawning (Uttering “aa’odhu billahi min ash-shaytaanir-rajeem” while yawning). One more such innovation is the mentioning of “sadaqallahul adheem” after reciting the Quraan. All these are innovated affairs. The people who initiated these acts would have never thought how widespread these could get. 5. Based on the above it’s extremely important to know if a particular thing that you do is from Sunnah or not. You don’t know who is following you! 6. One should constantly sit with ‘Ulemaa (scholars) and be in touch with them. Shaykh Taariq (hafidhahullah) said he finished Buloogh al-Maraam three times from cover to cover with Shaykh ‘Abdul ‘Azeez ibn Baaz (rahimahullah). Shaykh Tariq (hafidhahullah) also said that in one single sitting with Shaykh ‘Abdul ‘Azeez ibn Baaz (rahimahullah) they used to study five different books. 7. Shaykh Rabe’e advised to submit to the text (Quraan and the Sunnah). First of the ones to make Qiyaas (applying one’s own intelligence) was Iblees. His argument of him being made by fire made him think he was superior. This is one of the reasons of going astray. 8. Warning of staying away from affairs of fighting and spilling blood. The rebels say loosing 20,000 lives or so is a small price for the oppression suffered. Verily for a Salafi every life is expensive. The whole affair of making Khurooj is not meant for the general public. 9. Make a lot of supplications. Verily one of the reasons of winning the war in Jihad is the supplication of those who didn’t join. 10. When Salman al-‘Awdah planned a visit to Kuwait, Shaykh al-‘Anjaree wrote a front page article in the newspaper clearing the affairs of Salman al-‘Awdah. The Kuwaiti government al-Hamdullilah went ahead and cancelled his visit. Some 50 odd scholars then thanked the government for its intervention. 12. It is from Salafiyah to be from those who do charity discreetly. Also it’s better to go and help out the needy directly than to buy charity coupons. One should feel the charity. Seeing first hand the sufferings of the people increases one in Eemaan. He also mentioned names of Mashaykh from Kuwait regularly visiting refugee camps in Syria and Turkey to help our brothers who are being tested by Allah. May Allah ease their affairs. Verily He has power over all things. 13. Also he mentioned a Hadeeth about charity. 14. One valuable advice which he mentioned from Shaykh al-’Anjaree (hafidhahullah) was the only way to succeed is to be a hard worker. Just because you are smart does not mean that you will succeed. Indeed success is from Allah. 15. Manage time efficiently. If a task can be completed in 4 hours do not spend 13 days on it. 16. Verily there is Barakah (blessing) in the mornings so do not spend it sleeping at home. (referring to the time post Salaat al-Fajr). 17. Keep a balance between Deen (religion) and Dunyah (worldly life) and let one of them strengthen the other. 18. It’s not from the Salaf to just work 8 hours a day or 6 days a week. In fact they used to work all week around. The evidence is that the Khutbat al-Jumu’ah (Friday sermon) used to be short so that people could get back to their affairs at the earliest. 19. Strive as much as you can. Do not wait. Aid the Dawah as much as you can and in any manner. Those capable of financial aid should help with money, those capable of printing flyers should do so, and those who can translate should do so. 20. Be in constant touch of the Mashaykh and those whom they refer. In order for a place to contain something, it must be free from whatever contradicts it. This principle appljes to mankind and all creation as well as to belief and desires. So, if the heart is obsessed by belief in falsehood, there will be no place for truth. Accordingly, if the tongue is involved in trivial discourse, one shall be incapable of useful speech, unless falsehood is abandoned.Hence, if the body is busy doing wrong actions, then acts of worship will be inapplicable unless these contradictory actions are abandoned. This is how this principle is applied to concrete objects, and it is also applied to belief and religion. If the heart deviates from loving Allah, lacks yearning for Him and longing for His closeness, then the removal of contradictory feelings, like being related to other than Allah, is the only way for this heart to be overwhelmed by love for Allah. For the tongue to remember Allah, and the body to serve Him, one should be free of the impact of others like being busy remembering and serving them. Thus, if the heart is overwhelmed by the servants rather than the master, and is preoccupied with futile knowledge, surely there will be no place for being closer to Allah, or being acquainted with His Names, Attributes and judgments. If the heart listens to trivial discourse, there will be no place for listening or understanding the words of Allah. Besides, if the heart is inclined to love others, there will be no room to love Allah, and if the heart remembers others rather than Allah, no place will be found to remember Him, and the same applies to the tongue. This Prophetic tradition explained that it is possible that the inside of one’s body may be filled with poetry, which means that it might be exposed to suspicion, doubts, illusions, uncertainties, futile knowledge, and trivial discourse. So, if the heart is filled with such things, the facts of the Quran and precious knowledge, which cause happiness and perfection in mankind, will find no room in that heart.If a heart receives advice but it is filled with what contradicts it, there will be no place in that heart to accept this advice. The advice will simply pass over this heart and not be able to settle in it. The first is a meeting based on sociability and spending time, in which are more disadvantages than advantage, the least of which is corruption of the heart, and wasting time. 3. That such meetings become a habit or routine and they fail to achieve their aims. Enjoying health, this worldly life, status, a wife or children, then surely those feelings are temporary and will eventually dissipate. There are three kinds of passive feelings, which affect the heart and they are either related to the past, which causes sorrow, or related to the future so as to cause grief, of finally related to the present so as to cause distress. Subsequently, the hearts of man can be divided into two kinds, the first of which is the heart of those, who incline to the Beneficent, which is the source of brightness, life, happiness, pleasure, delight and blessings. The second one is the throne of the devil where narrowness, darkness, death, sorrow, distress and grief are settled therein. This heart is obsessed by sorrow for the past, and grief and distress for the present. In order for a place to contain something, it must be free from whatever contradicts it. This principle applies to mankind and all creation as well as to belief and desires.So, if the hearts is obsessed by belief in falsehood, there will be no place for truth. Accordingly, if the tongue is involved in trivial discourse, one shall be incapable of useful speech, unless falsehood is abandoned. Hence, if the body is busy doing wrong actions, then acts of worship will be inapplicable unless these contradictory actions are abandoned. He, who did not make use of his eye, did not make use of his ear. The servant has a Lord that he will stand in front of and a house that he will live in, so he must seek the pleasure of Allah before meeting Him and he should furnish his house before moving into it. Loosing time is harder than death, as loosing time keeps you away from Allah and the Hereafter, while death keeps you away from worldly life and people. The whole world from its beginning until its end is not worth an hour of sadness, so what about the sadness of whole life. What we love today will catch up with what we hate tomorrow, and what we hate today will catch up with what we love tomorrow. The most precious reward during life is to busy yourself with most suitable and useful matters in their exact and suitable time. How can he be rational who sells Paradise and what is in it, for one hour of passing pleasure? The pious man will leave this worldly life while he did not obtain satisfaction in two matters: crying for himself and praising Allah. If you are afraid of any creature, you will run away from it. When you are afraid of Allah, you will love Him and seek to be close to Him. If knowledge is useful without actions, Allah, the Exalted would never have dispraised the people of the book, and if actions were useful without devotions, He would never have have dispraised the hypocrite. 1. Protecting the heart and limbs against sin and forbidden actions. 2. Protecting them against undesirable matters. 3. Protecting against curiosity and whatever is not of one’s concern. The first will grant life to the servant, the second will grant his health and power, and the third will grant him happiness and joy. The sea of pleasures may drown its owner and the swimmer fears to open his eyes under water. Passing days are like dreams, the coming ones are wishes, and the time separating them is wasted. Buy for yourself (through doing good deeds) while there is still a market and you have the ability to buy. If you do not work hard and face difficulties along your way in seeking glory, you will never taste honor and relief when you attain victory. It was said to one of the worshippers: You are tiring yourself so much! He said: I want to achieve comfort from it. The human being was honoured with blessings of faith and good health, but he misused them, so they were justly taken away from him. The truth will only be shown to perceptive people who will use the light of their minds to see the consequences of the matters they face. The pleasures of life are similar to brides who are dressing for those who will prefer and choose; them or the brides (rewards) of the Hereafter, and whoever knows the significant difference between the two, will choose the best (the Hereafter). Affliction are but trials by which the faithful are distinguished from the unfaithful, and if you were to succeed therein, they would be turned to supporters by which you could attain your objective. No one can indulge in unlawfulness except for two reasons, the first of which is failing to trust in Allah, despite the fact that if one obeys Him, he will surely be granted the best of lawful gains. The second reason is knowing that whoever abandons anything for the sake of Allah, surely He will grant him something better than what he has abandon. Unfortunately, his vain desires surpass his patience and his inclination overpowers his mind, The first one has poor knowledge, and the second one has poor insight. How can one feel secure, who has an unmerciful wife, an unforgiving son, a distrusting neighbour, a friend who gives no advice, a partner who misjudges him, an enemy whose hostility never ceases, a soul that is inclined to evil, an adorned world, vain desires, influential lusts, furious anger, the deception of Satan, and controlling weakness? If Allah rescued and guided him, all those problems would be under control, and if Allah deserted and abandoned him, leaving him on his own, all these distresses would cause his destruction. He who tastes the pleasure of good health, surely the bitterness of patience will become easy for him. The aim has priority in estimation, it is the last in existence, it is the principle according to the mind, and it is the end of the journey. Your life in the present moment is in between the past and the future. So what has preceded can be rectified by tawbah (repentance), nadam (regret) and istighfar (seeking Allaah’s forgiveness). And this is something that will neither tire you, nor cause you to toil as you would with strenuous labour. Rather it is an action of the heart.Then as regards the future (then it can be corrected) by withholding yourself from sins. And this abandonment is merely the leaving of something and to be at ease from it. This also is not action of the limbs, which requires you to strive and toil. Rather this is a firm resolve and intention of the heart – which will give rest to your body, heart and thoughts. So as for what has preceded, then you rectify it with repentance. And as for the future – then you rectify it with firm resolve and intention. Neither of these involves any hardship or exertion of the limbs. But then your attention must be directed to your life in the present – the time between two times. If you waste it, then you have wasted the opportunity to be of the fortunate and saved ones. If you look after it, having rectified the two times – what is before and after it, as we have said – then you will be successful and achieve rest, delight and ever-lasting bliss. However, looking after it is harder than that which comes before and after it, since guarding it involves keeping to that which is most befitting and beneficial for your soul, and that which will bring it success and well-being.